In a move to further shore up its balance sheet, Rolls-Royce has agreed to sell its subsidiary fuel injection technology firm, L’Orange, to Colorado-based Woodward in a £610m (US$860m) deal. The transaction should be completed by the end of September this year. According to Rolls-Royce, the sale of L’Orange will “improve resilience” of the balance sheet, with the extra capital being used “to pursue opportunities that will drive greater returns". With a workforce of over 1,000 employees, L’Orange is responsible for manufacturing fuel injection products in areas including marine power and propulsion systems. Last year the operation achieved sales in the order of £212m (US$299m). Colorado-based Woodward designs and manufactures control systems and components for the aerospace and industrial sectors and, on the basis the deal is approved by regulators, the new company will be called Woodward L’Orange. Andreas Schell, President and Chief executive, Rolls-Royce Power Systems, commented: "Rolls-Royce Power Systems will remain a key customer of Woodward L'Orange. "We have enjoyed working with L'Orange who have a leading position in their markets, excellent technology, a skilled workforce and strong leadership. We wish them well as they join the Woodward organisation." Rolls-Royce, which employs approximately 50,000 staff spread out through 50 countries, announced a return to profit in March. It recorded a pre-tax surplus of £4.9bn for 2017, predominantly thanks to a £2.6bn (US$3.67bn) accounting boost from the strengthening of the Brexit-hit pound. Universal Asset Management (UAM) has completely recycled carbon fiber from commercial aircraft. This monumental milestone in sustainability firmly entrenches UAM as a global leader in complete aircraft recycling. To illustrate this achievement, UAM will present a 3D-printed engine stand manufactured from carbon fiber reinforced polymer (CFRP) from commercial aircraft at the three-day MRO Americas conference. The resulting second-generation carbon fiber material is fit as raw resource for industrial use. As such, it becomes a feasible supply for advanced additive manufacturing supply chains, utilized by automotive and other manufacturing industries in need of cost-competitive carbon fiber. Of all the structural elements comprising an aircraft, carbon fiber is the most arduous to recycle. Efforts during the past fifteen (15) years have not yielded a viable solution that wholly completes the circular economy of carbon fiber back into manufacturing. It is with vigor that UAM undertook the challenge. Now, its success opens the door to possibilities even beyond aviation, paving the way to total aircraft recyclability. UAM’s proprietary engineering in the use of CFRP from retired aircraft is a harbinger of future products under development by UAM’s Innovation Technology Team. CFRP use is on the rise, as today’s modern aircraft are now made of approximately 50% composite material, compared to aircraft from the 1970’s which were manufactured with less than 1% of carbon-based materials. The increasing availability of composites in younger retiring aircraft is an opportunity that is leveraged with UAM’s proprietary techniques. The UAM design team is led by Keri Wright, Chief Executive Officer. CFRP was collected through UAM’s proprietary process, filtered for purity and refined into pellets, to therefore be used as raw material for 3D-printing. The innovative and bold process applies material science and advanced manufacturing techniques pioneered by UAM’s Innovation Technology Team. By proving that aviation components can be re-born out of composites from end-of-life aircraft, UAM has taken the technical to technology. Options for the >12,000 aircraft being retired in the next 20 years are boundless with this advancement. The successful delivery of the engine stand is tangible proof of the viability of using sustainable, digital manufacturing solutions in the aviation industry. UAM will be discussing recycling opportunities and benefits with both aviation and non-aviation companies in the months following MRO Americas. AerCap has announced its major business transactions during the first quarter 2018. The Company signed lease agreements for 83 aircraft, including 15 widebody aircraft and 68 narrowbody aircraft. AerCap purchased 7 aircraft, including 2 Airbus A320neo Family aircraft, 2 Airbus A350s and 3 Boeing 787-9s and executed sale transactions for 24 aircraft, including 11 Airbus A320 Family aircraft, 4 Airbus A330s, 1 Airbus A340, 1 Boeing 737 Classic, 1 Boeing 737NG, 2 Boeing 777-200ERs and 1 Boeing 787-8 from AerCap’s owned portfolio and 2 Airbus A320 Family aircraft and 1 Boeing 737 Classic from AerCap’s managed portfolio. The Company continues to manage 12 aircraft that were sold from its owned portfolio during the quarter. AerCap has signed financing transactions for US$2.9bn. SkyQuest International has reported aircraft sales for the first quarter of 2018. The company sold three Cessna 208s, including one 208 Caravan (Serial Number 208-00158) sold on behalf of Aberdair Aviation (Kenya) to Randigo, LLC (USA), one 208 Caravan (Serial Number 208-00422) purchased from Verona Aviation (USA) on behalf of R&r Airwork GmbH (Germany), one 208B Grand Caravan (Serial Number 208B-0661) purchased from Air Cargo Carriers (USA) on behalf of Pacific Coast Aircraft Lease Group (USA). Furthermore SkyQuest sold one de Havilland DHC-6-100 (Serial Number 46) on behalf of Elite Air Transport (Dominican Republic) to Gravitas Aviation Ltd. (Dominican Republic), one Quest Kodiak 100 (Serial Number 100-0139) sold on behalf of Fayard Enterprises (USA) to Scenic Air (Africa) and one Fairchild SA227-AC Metro IIB (Serial Number AC-754B) sold on behalf of Apache Aviation (USA) to Castle Aviation (USA). Avianor and Lufthansa Technik of Hamburg, Germany have signed a Cooperation agreement. The agreement provides Avianor with access to Lufthansa Technik's Base Maintenance modular services in the areas of Planning, Engineering, Materials, Logistics and Benchmark performance data. With Lufthansa Technik's centralized Base Maintenance Services Avianor can benefit from the data and experience of thousands of aircraft maintenance events. Therewith Avianor increases its quotation accuracy and has the potential to greatly improve event TAT due to precise work preparation and enhanced planning and material support. With these resources at its disposal, Avianor can accelerate its growth, increase customer service and quality and offer clients world class back office support. 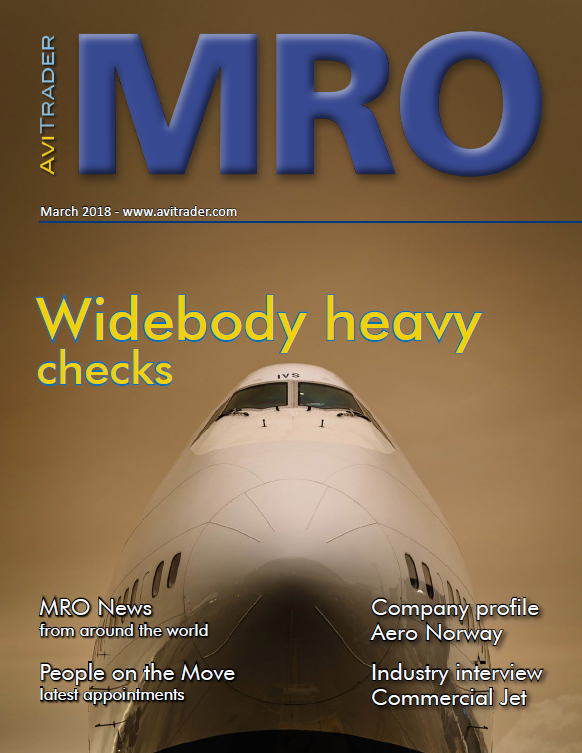 "This agreement allows our relatively small MRO to compete more equally with the larger players in our industry," said Earl Diamond, CEO of Avianor. 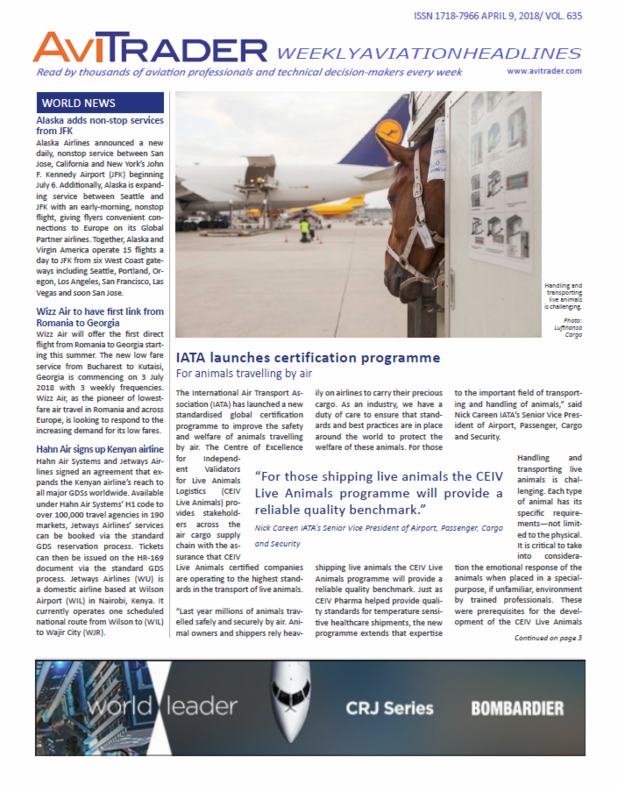 "Being a subscriber to Lufthansa Technik's modular services, Avianor took the first step to be part of Lufthansa Technik's global network". "We are pleased to welcome Avianor as Cooperation partner to foster the strategic development for modular services of Lufthansa Technik's Base Maintenance network," said Thomas Rueckert, Vice President Base Maintenance Services at Lufthansa Technik. Over the next six months, the roll out of these new services will be completed. Further developments of already identified potential in other fields of collaboration are planned to widen the range of cooperation in the future. StandardAero Component Services (SACS) has announced it will unify its Jet Aviation Specialists (JAS) and PAS Technologies brands underneath a single StandardAero Components Services brand name, effective immediately. StandardAero acquired JAS, a Miami based component repair shop in February, 2017 and later in May last year, the company acquired PAS Technologies, a high technology components provider with three U.S. sites and locations in Romania and Singapore. The combination of all companies has enabled StandardAero Component Services (SACS) to build a strong global business through geographical expansion and expanded services, while achieving significant synergies and growing customers and platforms. While the brands are changing, the legal entity/names of JAS and PAS Technologies will remain unchanged so customers will not need to change their systems. In addition, legal entities listed on airworthiness authority certifications and releases will also remain unchanged. C&L Aerospace, a C&L Aviation Group company, has signed a material support agreement with TAG Airlines for their Embraer 145 and Saab fleet. This new partnership will allow C&L to better support its customers in the Latin American market. C&L Aviation has been in the Saab 340 business for more than 20 years and is recognized as a world leader in the regional aircraft market. C&L entered the ERJ market several years ago and continues to see considerable growth in those areas. In addition to the material support agreement, TAG Airlines has hired C&L for its paint services as well. WestJet has reported March 2018 traffic results with a load factor of 85.6% per cent, an increase of 1.5 points year over year. Traffic increased 7.0% year over year, while capacity grew 5.2% over the same period. WestJet flew a record 2.2 million guests in March, a year-over-year increase of 6.7% or approximately 136,000 additional guests. Engine MRO specialists, Aero Norway AS have appointed two new members of their senior management team. Neil Russell will undertake the role of Chief Operating Officer and Rune Veenstra as the new Chief Business Officer. These appointments are part of Aero Norway’s refreshed management structure which will see Russell and Veenstra act as divisional directors under CEO, Glenford Marston. Russell’s appointment follows a seven year career with TechnipFMC where six of those were spent as Engineering, Production & Supply Chain Director. In his new role, Russell will largely be responsible for growing the business, improving the efficiency and increasing profitability in line with the company strategy. Veenstra will be joining Aero Norway after five years as Managing Director at Heli-One Norway a helicopter MRO Company, and six years at Norsea AS, the oil service company. As Chief Business Officer at Aero Norway, Veenstra will work closely with Neil Russell to drive business growth and market share; he will also be accountable for the development of the Company and commercial strategies. CTT SYSTEMS AB (CTT), a market leader of aircraft humidity control systems, has unveiled China Southern Airlines as the previously undisclosed airline that selected the A350XWB optional Inflight Humidification system, first ever to be fitted in Business Class. Increased humidity is essential in offering a cabin climate that makes passengers feel more balanced and at ease during long-haul flights. In the humidified Business Class cabin, passengers more easily will stay hydrated, aiding quality of sleep and reducing jet lag. China Southern Airlines has selected SFE humidifiers on all of its 20 A350-900 aircraft on order. China Southern pilots, crew and passengers will all benefit from a dedicated humidifier in flight deck, in both crew rests and three in the large Business Class cabin. First entry into commercial service is scheduled to mid-2019.